A collection of oddities and strange findings written in bad grammar. Any kid growing up in the 80’s and early 90’s in New Jersey ( ME! ) remembers Action Park. If you were lucky (or unlucky) enough, then you’ve even gone there. For me, it was after days/weeks of convincing that my mom finally agreed to take me and my best friend at the time, Chris, on the hour long drive on the mostly wooded highway, Route 23, to Action Park! At the time, if you haven’t gone there, you only heard stories of how awesome this place was, and of how dangerous this place was and the injuries that happened to people who dared to experience the park. If you did get to go, you had your own tales to tell. My mom, friend and I went on to have a fun and safe day. (sorry for the build-up) No injuries, just some exciting memories that have mostly faded over the years. We survived the Alpine Slide, and we dared not to go on the Cannonball Loop (seen below). 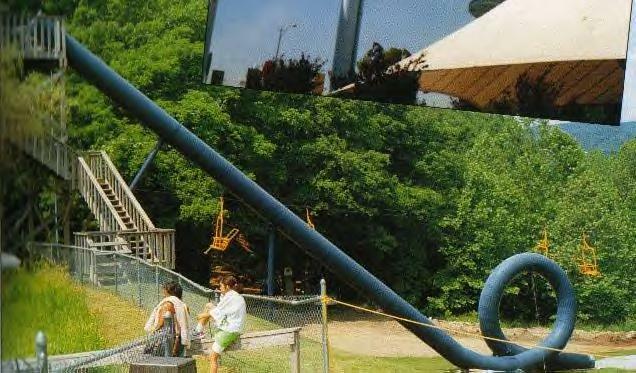 I actually completely forgot about this place but this morning, while looking for carnivals or fairs to take my two year old son to this summer, I found this article called, “Remembering Action Park”, and it all came back to me. If you feel like taking a trip down memory lane and recalling the adventurous days of your childhood, give this article a look. I’m sure it will bring up some interesting memories. Seems like someone always has a crazy memory to share of their visit to Action Park. (maybe not me, but most people do) I suppose that’s why their tag line was, “There’s nothing in the world like Action Park”. Have any good stories of your own from a trip there? Please share, I’d love to hear about it. Happy, safe summer to all! Here again is the link to the article in case you want to read it. I'm a graphic designer and illustrator living in the tri-state area of the NYC suburbs in NJ. I have a number of web and design based companies and wierzo's world is the red-headed, bad-boy step child that helps let my creativity flow organically. I hope you enjoy my posts and I look forward to some great discussion (or at least a chuckle or two). This entry was posted in Random and tagged #80s, #actionpark, #adventure, #amusementpark, #childhood, #danger, #jersey, #newjersey, #NJ, #summer, #summerfun, #waterpark, #weird, #weirdnj. Bookmark the permalink. wierzo on Uploading while Downloading?